With the year in full swing it almost feels ironic to be talking about sleep; nobody is getting any and no one has time for it! Sleep is one of the 7 pillars that I feel so many of us are challenged by. Something as simple as closing your eyes and simply sleeping, seems to have become an exclusive commodity of our time. When we talk of this pillar of health, we need to think about not only in its quantity, but the quality of sleep we are getting. There is no point boasting about spending 8 hours in bed, when half of it was spent tossing, turning, or watching cat videos on our phones. Despite what we think, sleep is actually a very busy time for our bodies. As we sleep, we filter and process all the things we learned that day. Our muscles and organs restore, regenerate and repair any damage from a hard days work; and our immune system and metabolism are checked and balanced. The less sleep we get, the shorter time our body has to perform all these functions. Not only do we “feel tired” and have trouble thinking after a rubbish nights sleep, but we may also perform physically worse in our tasks; the gym may feel harder, or co-ordination may be affected, even walking up the stairs at work could feel like a challenge. How we can get better sleep? Sleep hygiene is a big factor for many of us who are getting poor quality sleep. A 2016 Sleep Health Study run by the University of Adelaide and the Adelaide Institute of Sleep Health, cited that the effects of the “24/7” society is a major contributor to our poor sleep habits. They found that 26% of adults have both internet use habits just prior to bed AND have consistent sleep difficulties alongside sleep deprivation problems during the day. This month I ASK you to look at your sleep hygiene. I challenge you to make a one-hour window before bed to be “screen free”. Let’s put away our smartphones, iPads, laptops and PC screens. Instead, let’s use this time to start winding down. Use this window to read, listen to music, journal, chat with your children/partner/housemates. Perhaps some (gentle) stretching or yoga nidra is up your alley. UNWIND. Sleep isn’t just about doing, it’s also about the environment you set yourself up in. Your bedroom should be a sanctuary for sleep. Get rid of the computer desk, the TV, the piles of laundry waiting to be folded; none of these items inspire a calm, restful mind. If you use an alarm clock, turn it to face the wall so that the LED doesn’t face you. Switch your phone to flight mode. Think about your physical comfort too. Do you need to invest in block-out shutters it you live on a main street? Is it time for that new mattress or pillow? 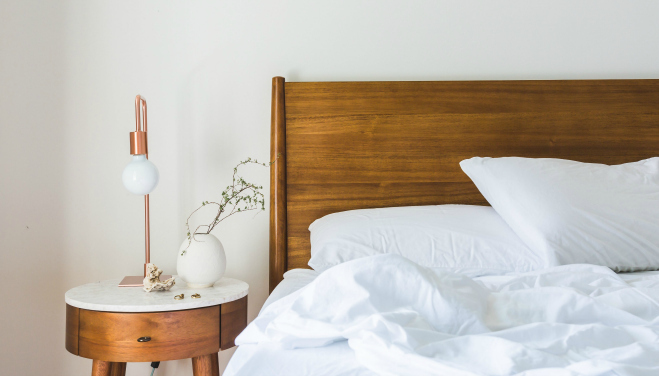 This month I challenge you to make your bedroom the best sleep sanctuary you’ve ever had.